Hi! Well, here are the wedding invitations that I made for my nephew's wedding. Making something so formal was a first for me! I used SU's Shimmery White, and I think the picture picks up on the shimmer. The girls are wearing red and the guys black, so that's where the color scheme originated. I was inspired by this card. 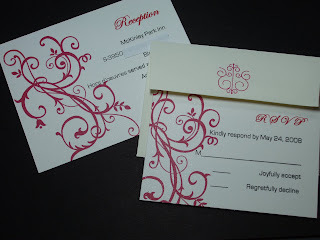 A little while back, MJ Albright had done invitations for someone and packaged them really nicely. You can see that post here. I did the same. 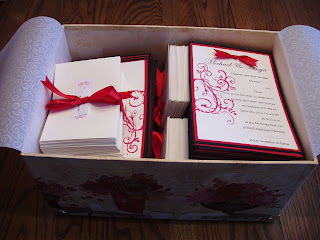 I bought the box at AC Moore, used the red satin ribbon to tie up the envelopes, reception cards, and RSVP cards so they wouldn't slide around in the box. 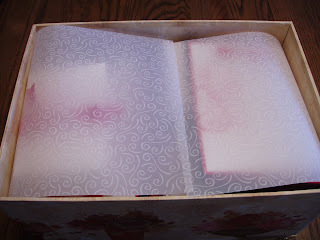 I took two pieces of retired SU's swirly vellum to protect the invitations. Here are the pictures. Tanya is coming to pick them up tomorrow. She's seen the final product, but doesn't know I packaged them like this. This is part of their wedding gift, so I hope she is surprised! Thanks for stopping by! The wedding invitations I've been making for my nephew's wedding are finally done! My hands and fingers are red (from the ink) and extremely sore (I think I've got blisters)! It's late (oh my gosh it's 11:00 p.m.!) and I haven't taken pictures yet. I'll do that tomorrow and post them here then. Have a wonderful tomorrow! WNY SCS Stamping Event Tomorrow! Hi all! Well, I certainly have been busy. Tomorrow is the first SCS Stamping event being held in WNY (in Ransomville, just north of Buffalo). Tracy Harp (Lodichick) and Holly McMillen (Toy) are hosting this event. They are former Dirty Dozen members on SCS. There will be 52 of us there, and it looks like it will be quite the event. I have been busy stamping away all the projects I needed to complete for the event in addition to making wedding invitations for my nephew's upcoming June wedding. I had to cancel my club date in order to finish all of this stamping (thanks, girls, for changing your schedules!). Here is the card front I did for the SU only card front swap. I'm really happy with it. I got my inspiration from the latest Take Ten magazine that I was browsing through in AC Moore. I thought this would be an easy card to reproduce 26 times, but I wasn't thinking about punching all those squares (104 white, 52 green, and 52 red)! Yes, what was I thinking? Well, I'm happy with it and also happy it's done! 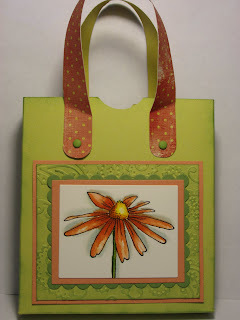 I used the Tart and Tangy SU set from the Occasions Mini catalog along with the Summer Picnic paper. 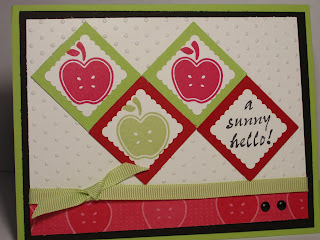 The sentiment is from a retired SU set called Simply Summer. I also used the Swiss Dots cuttlebug folder, certainly celery grosgrain ribbon, black brads, certainly celery, black, real red, and whisper white paper. The smallest Marvy scallop punch was used on the white squares and SU's 1 3/8 square punch was used for the green and red squares. This next card was done for a shoebox project. We had to prepare this project for 10 other stampers. 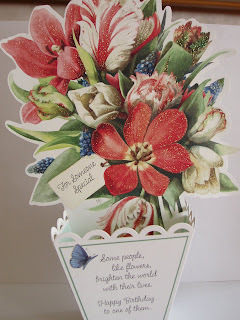 I chose to do this card, which is similar to the one that I did here for a Ways to Use It challenge. We were to use fashion as our inspiration in that challenge. Well I LOVE shoes, so I chose this stamp from My Sentiments Exactly. and I love the pink and gray together! 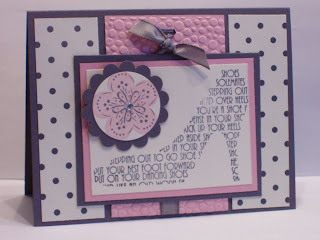 I used basic gray, pretty in pink, and vanilla cardstock. Charbon dp (retired) was a perfect match (I had just enough to do this project, whew!). 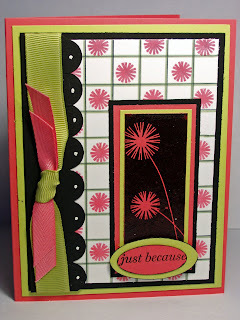 I used SU's scallop and circle punches and A Beautiful Thing set. I stamped the image in pink first, then overstamped in basic gray. I added some bling in the middle. 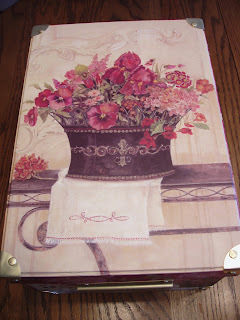 A cuttlebug folder was used on the middle pink panel. Oh, and I used the basic gray taffeta ribbon which was tied through the hole punched with the slot punch. Next was the 3-D swap. I had something else in mind, but changed it to these coasters. I got these 4" x 4" tumbled marble tiles at Lowe's. They came in a box of 9 for about $5.00. The stamp is from Stampa Rosa and is one complete stamp (not 3 different ones!). I've had it forever, and when I measured it to the tiles, it was perfect! I stamped it in black Stazon and colored it with my chalks. Very easy to do! They were NOT time intensive! I then baked them at 350 degrees for about 15 minutes. I don't know if you HAVE to do this, but they say it sets the ink, however, it did not set the chalk. I then sprayed it about 3 times with a matte finish sealer. I used a roll of cork cut into 3.5" squares on the back with some adhesive. (I ran out of Mono Adhesive, so I used E-6000 and it smells SO BAD! I have the coasters airing out in the garage right now! I hope it wears off before tomorrow! Needless to say, I threw that adhesive in the trash!) 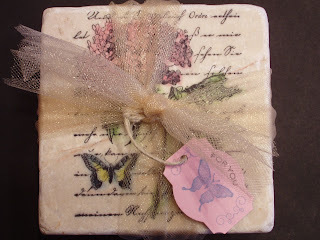 I tied four coasters together with some tulle netting and attached a "For You" tag with my name and info on the back. This is the last one, I promise! There is going to be a door prize swap. We were to buy/make something related to stamping and had to wrap it. 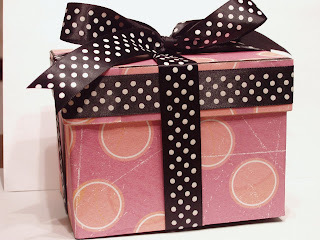 I won't tell you what's in the box until after the event, but I wrapped it in a paper mache box that I covered with pink patterned paper (don't know who makes it) and some black and white ribbon. I think it came out really cute! Well, I'll have more to report either on Sunday or Monday about this event. I'll also post the wedding invitations I'm making. They really are very pretty, if I do say so myself! Thanks for stopping by! ME! Yes today is my birthday! I won't tell you how old I am, but I will tell you that there have been 10 presidents during my lifetime! I had to count that one a couple of times and check my Social Studies book to make sure (LOL)! When I checked SCS this morning, I had three birthday messages. One was from Cheryl Rowley, another from Michelle Goodrich, and the third from Melody (lacyquilter)! How nice was that? Then when I checked my email, I had one from Splitcoast! I had to point to the date on the newspaper my DH was reading to remind him of the date! He knows the date, but thought the 19th was tomorrow! I bought four sets of Nestabilities from him for my birthday. He never knows what to get me, so I always pick it out and he pays! Not a bad deal! These are some cards I received. This first one is from Cheryl Rowley. Isn't that watercoloring amazing? This next one is from my friend Tracy. She has been participating in the SCS challenges daily, but doesn't post them. I told her she needs to start. She's been stamping for a while, but has recently gotten herself organized and carved a little space in her basement and has been happily stamping away. She has done some awesome stuff. This last one is a Hallmark card from my friend Sue in Columbus, Ohio. I had to post this cause I thought it was so cool! I may take this apart and try to re-create one like it later! I took a photo from above so you could see how it's put together. Cool, huh? Thanks, Sue! I also want to thank all my family and friends who have called to wish me a happy birthday! We are off to dinner! DH is getting anxious! I did this for an inspiration challenge on SCS a while ago. 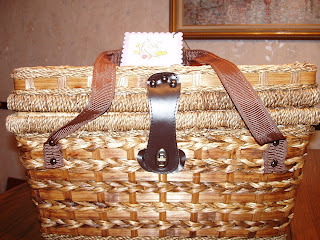 The paper on the bottom was inspired by baskets in the inspiration piece, so I thought it went with the basket theme. 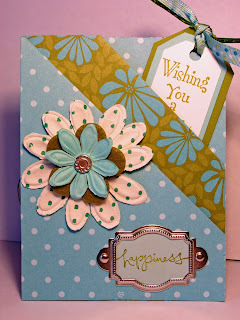 You can see the details of this card on my SCS gallery. I hope she likes the gift and puts it to good use! Thanks for stopping by! Yes, I met a new stamping friend...Cheryl Rowley! She lives about an hour from me, and we have a lot in common! We are both elementary teachers, she grew up in the town of Cherry Creek, NY, which is where my husband and I own some land and a cabin, and we got married on the exact same day...April 11, 1992! I told her that maybe we were twins, but alas, we don't look alike! How coincidental is that? We met this morning at Starbucks, talked for a while (mostly about teaching, not stamping), and then went next door to JoAnn's and ACMoore. We bought some Inkadinkadoo clear stamps on sale at JoAnn's for $5.99 (what a steal) and some other goodies. We had a great time! She also gave me this gift! 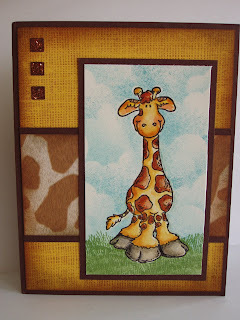 I mentioned that I liked giraffes, so she stamped me some of these images as well as the mouse and balloons. That stamp is a monkey, which is totally cute. 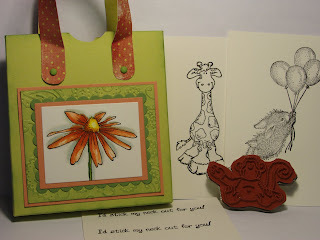 Also in the bag were some sentiments that say "I'd stick my neck out for you"! So cool! And check out that box! 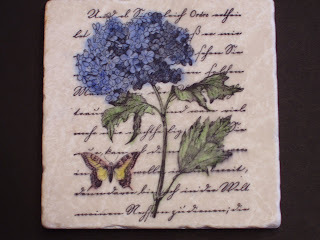 I think she said that the image is a Whipper Snapper flower that is watercolored (her signature style). 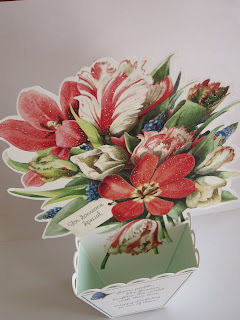 Go over to her gallery at SCS here to see her gorgeous cards. We are meeting again next Saturday for an event in Ransomville, NY that Tracy Harp and Holly McMillen (Toy) are hosting. 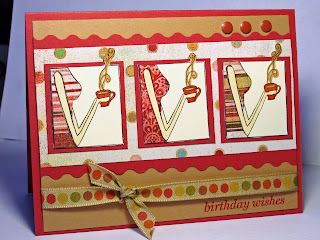 Can't wait for that, but I need more time to do all the stamping I need for that event! Thanks, Cheryl, for the great gift and fun afternoon! Say it isn't so! Sometimes it's scary how much I think like my parents did when they were my age! You never think you will be like them, but you just turn into them! My girlfriend, Nancy, is turning 50 on Sunday! I just cannot believe my friends are getting to be this age! We still think and act like 25 year-olds (or at the most 30)! Anyway, when I saw this clear stamp set by Inkadinkadoo called Humorous Birthdays at JoAnn's the other day (at 40% on sale, this was only $5.99! ), I knew I had to get it! It has about 6 other images that are hilarious! I figured I'd get good use of them! This is for today's Sketch Challenge at SCS. I really like this sketch. Since this girl looked like something from the 70's, I decided to use this Jersey Shore SU paper. It looked "mod" to me! I don't know if you can tell in the picture, but I paper pieced her outfit! It looks like something I wore way back in the 70's! 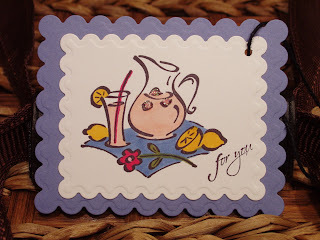 I used brilliant blue and groovy guava cardstock and the matching groovy guava ribbon. The Build-a-Brads were perfect for this paper. I just used the 1/2" punch to punch one of each color flower. Perfect! I colored her hair a and face with Copic markers. Love those things! I think Nancy is going to get a kick out of this one! Thanks for stopping by! This is for today's color challenge, basic gray, groovy guava, and blush blossom. I love anything with this basic gray. If you don't have it, you need it! It's a great neutral and pairs up with pretty much any color. This is not one of my favorite cards, but I think it will do. The picture is very dark. The card is much lighter IRL. When I had my photoshop automatically fix the colors, it came out way too bright, so I left it alone. (Edited: I added stickles to the flower centers and butterflies and re-took the picture. It's still a little too dark, but better than the first one!) 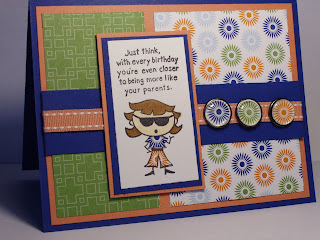 The layout is from Julee Tilman's Mojo Monday Sketch Challenge #33. I love sketch challenges! The layout of a card is really half the battle when I make a card. There are many sketch challenges out there in blogland that the girls are hosting, so surf around the blogs I have listed on the left sidebar of my blog and join in! This card is a 5 1/4" square. The base is basic gray and I layered groovy guava and blush blossom next. The blush looked too pale when I started to put it together, so I stamped the open circles from PTI's Polka Dot Basics in blush ink. It just gave it that extra texture. The flower was colored with using the guava and my blender pen (the In Colors don't come in markers...bummer). The centers were done the same way with the gray. I snuck in some garden green because I didn't want my stems and leaves in gray. I used my large rectangle nestibilities and also embossed the frame around it (I don't know if it shows up in the picture very well). I then sponged the gray around the edges to give it more definition. I chose a circle theme for this card. The dp is Groovy Guava designer prints and Charbon (retired). I added the taffeta gray ribbon, per the sketch. The sentiment is PTI's Mixed Messages in gray. It just filled in that blank spot nicely. My girlfriend is turning 50 on Sunday, and this may be the card I send to her. Thanks for stopping by! Today's SCS challenge was to make a double pocket card. Boy was this fun! The directions can be found here. I got stuck for a minute on the sixth picture, but I finally got it and when that step was figured out, the card just seem to come together magically! It really is easy to do. I suggest you try it! I started with this Petals and Paisleys double-sided paper (a necessity for this type of card) because I have so much of it and I chose one that I thought was my least favorite. I didn't think I was going to like this card, so I was stingy with my favorite papers! Well, as it turns out, I really like this! I had these Primas that matched and also used the olive felt SU flower. This is the first time using the Hodgpodge Hardware in the Styled Silver, and boy is it shiny! It's so pretty IRL! I stamped the sentiment from Warm Words in olive on softy sky paper. I only made one tag using old olive, cool carribbean, and whisper white because I thought I may put a gift card in the other pocket. The sentiment on the tag is from Hero Arts and reads "Wishing you a day of smiles and laughter". This was a perfect stamp because it is written vertically, one word per line. At the bottom I stamped a butterfy in cool carribbean. Try doing this card, I guarantee you'll be amazed at how easy and fun it is to do! Thanks for stopping by! 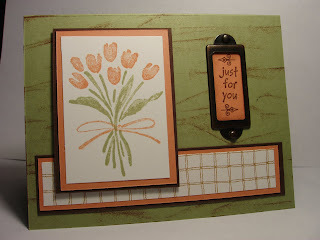 Well, I did another card by Kharmagirl, today's Featured Stamper. I chose this card to case this time. I have had this set for some time, but never inked it up! How sad is that? I kept the layout, but changed quite a few things. First, I paper pieced the girl. I chose Basic Grey's Blush, which set the tone for the rest of the changes. I used SU's Ruby Red and Creamy Caramel. The ribbon was just a happy coincidence. 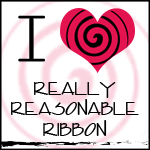 I have a varied collection of ribbon, and this one worked perfectly for the colors and design. The arms of the girl and the cup and steam were colored with copic markers. Since the paper pieces were so intricate and small (quite a challenge to cut it out perfectly! ), I used my Xyron machine. I forget about that nifty little machine sometimes. It worked great for this because there isn't much of a surface area for tape. I added the metal dots at the last minute to balance off the card. Thanks for stopping by! Scroll down for the next post. Oh my gosh, does it feel good to be stamping again! 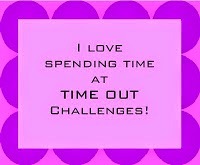 I can't believe how crazy it has been...being sick, finishing invitations, completing report cards, blah, blah, blah! I have a whole week off, so I'll be in my stamping room A LOT! 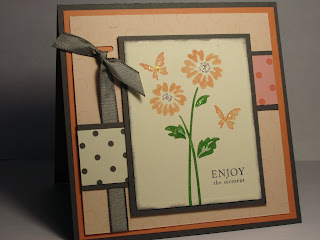 I have been in my stamping room all morning putting new SU sets together. (I love the die cut ones! Wow are they easy and fast to put together!) I was also putting all my Papertrey Ink ones together. I think I had 4 or 5 sets that needed to be put into their CD cases! Wow, it has been a long time! 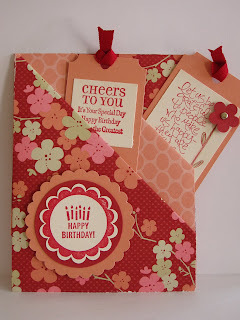 This card is for today's feature stamper, Kharmagirl (Jodi). Check out her amazing gallery! A very talented stamper. This is the card I chose to case. 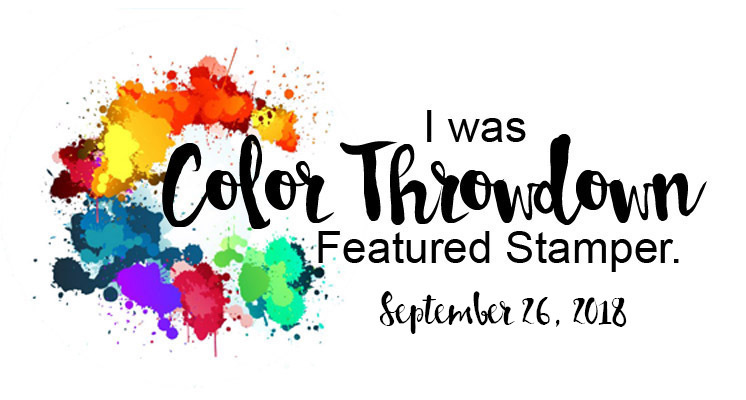 The first changes I made were the colors. I used PTI's Berry Sorbet and Spring Moss. I used the ribbons from that color family as well. I was too lazy to do the eyelets (let's face it, I hate setting eyelets! ), so I just used the white signo gel pen instead. The flower was stamped on Berry Sorbet with Versamark and heat embossed with black embossing powder (it's not black paper!). The white "dp" was done with a ruler, a black marker, SU's Mellow Moss marker, and the little flower from Text Boxed. Another change I made was the sentiment. I'm going to send this to our friends, Robi and Patty, in Cleveland, Ohio who we visited last weekend "just because". I have a Willow Tree trinket box to send to Patty because she has a collection of them. The "just because" sentiment is from PTI's limited edition anniversary set that many of us received for free...yes I said free! PTI celebrated their one-year anniversary by sending this limited edition set to anyone who purchased a certain amount of their sets during the year. (Need I say that I purchased most if not all of their sets? I really like them!) This set has a bunch of sayings and some really cool "element" stamps, as SU labeled them in their catalog. Hope you enjoy this card. I may have another card to post a little later. Thanks for stopping by! I've been reading on all the blogs about how everyone has been hit with this flu bug and never thought it would reach my blog, but it has! Sorry I haven't been around, but it's been very bad! I hope to have something later today or tomorrow! I'm getting antsy, so I think that means I'm getting better! 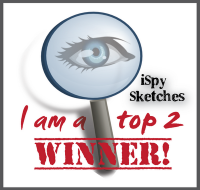 I just saw I went over the 2,000 mark in hits to my blog! Probably half of them are from me (LOL!)! Thanks for stopping by!